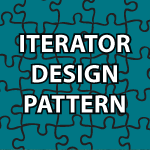 Welcome to my Iterator Design Pattern Tutorial! The iterator design pattern allows you to access objects that are stored in many different collection types. You do this by creating a common interface that these classes share. Then you have them provide you with an iterator that allows you to traverse the objects they contain. Because they all share a common interface you can treat them polymorphically and eliminate a lot of duplicate code. The example video will explain how and the code that follows will reenforce the concepts. // basis. This is BAD! Just wanted to say thanks for all your work. Great job! very nice stuff on design patterns. Thanks a ton. You’re very welcome 🙂 I’m finishing up object oriented design today. Then the next tutorial will be on code refactoring, which will help you incorporate design patterns into your designs. WoooW , This is absolutely Great . You’Re The Man , You’Re The Best . I have always found your videos and code on design patterns to be very concise and to the point. Please continue your good work, and thanks a ton ! Another Great article.. Thoroughly explained..
really swift,fast and great tutorials, u r simply great dude! Another great tutorial! You make it look so easy! Thanks again! Hello. Great job. Mr Derek. Can u share the UML schema of that design Pattern too ? I did. And i want check mine. Thank you 🙂 I’m not sure what schema you want. I have the whole presentation if you want that. Here is a link to the whole presentation. It is a bit messy because I never planned on giving it away, but everything is there. Thank uu . U r great man 🙂 U r doing the best thing in the world. Thank you 🙂 You’re very kind to say that. Thank you SO MUCH for all your veideos. I am amazed that people take their time to do this for everyone to benefit. I feel like you are providing great content and great help. Thank you so much! P.S. This helps a lot with exam revision too! You’re very welcome 🙂 I have continued to do this because I have found so many wonderful people on the internet that I have not found any place else. I’m more then happy to help. Actually you’ve created a new Learning pattern ;). Doesn’t matter How much complicated the topic is, just watch the video once and then go through the code, you get it. Good work Derek! Thank you for the compliment 🙂 That is the idea behind making each video.